Habitat: Fresh water slow-moving rivers, lakes, swamps, and marshes of West Africa. Physical description: The muzzle of the dwarf crocodile is broad, blunt, and short; hence the name "Broadfronted." It measures at about 1.20 meters in length; however, some have reached lengths of 1.50-1.80 meters. The dwarf crocodile gets its name because it is the smallest of all crocodiles. With the largest crocodile reaching lengths of 27 feet and weigh up to a ton, it is easy to see how a crocodile of about 3 feet could be dubbed "dwarf." Alligators and crocodiles are easily confused and exhibit several major physical differences. Alligators have broader heads and blunter snouts. Their lower teeth fit inside the edge of the upper jaw and cannot be seen when the lipless mouth is closed. The crocodile's fourth tooth in each side of the lower jaw is located lying in a notch in the upper jaw and is always visible. The teeth are used for seizing and holding prey instead of for chewing. They are replaced continuously as new ones grow up, forcing old ones out. Like all crocodiles, the dwarf has rigid teeth and tough scales, which cover the body. During early years of existence, the dwarf crocodile is yellow with a brown tint. The infant dwarf crocodile also has black spots on its belly and back. However, with age, the dwarf crocodile grows to resemble other forms of crocodiles in color. 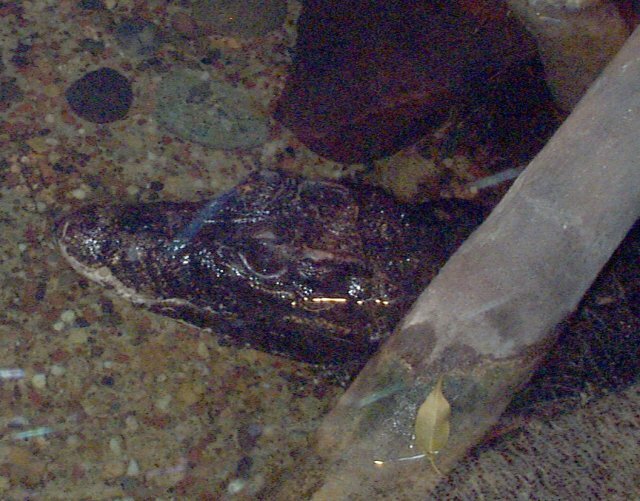 By maturity, the dwarf crocodile is dark brown or black. The scales become harder and the bony palates that protect the back are more dense. The term crocodilian is applied to any of the order Crocodilia alligators, caimans, and gavials, as well as true crocodiles. There are about 20 species of living crocodilians, all of which are lizardlike, egg-laying carnivores. The Dwarf Crocodile, known as the Broadfronted crocodile, or scientifically Osteolaemus tetraspis comes from Africa. 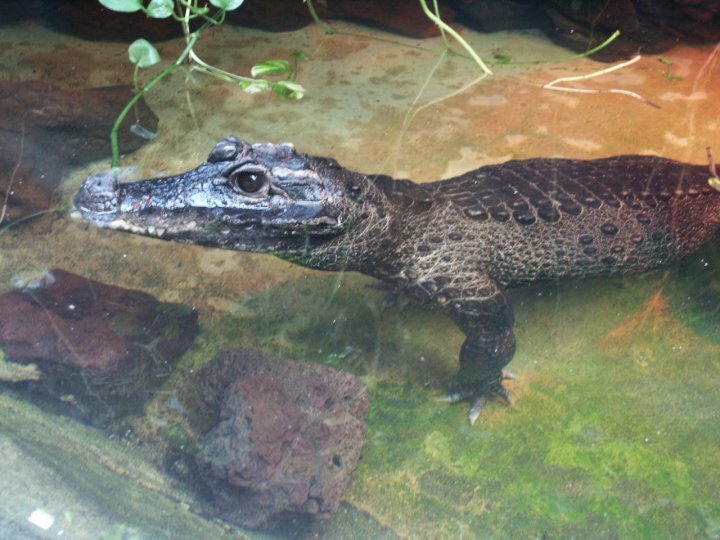 There are two subspecies of the Dwarf crocodile. The West African Dwarf crocodile or Osteolaemus tetraspis inhabits the forest areas of Liberia, Calabar, Cameroon, Sierra Lenone and Gaboon. Paul du Chaillu discovered this subspecies. The snout of this subspecies appears swollen. The Osteolaemus tetraspis osborni hails from the upper Congo region and can be found mainly in the Ituri Forest. This subspecies lacks the swollen appearance of the Broadface. Special anatomical, physiological or behavioral adaptations: Crocodilians are carnivores and are nocturnal that is, mostly active at night. During the day they often lie at the water's edge in large numbers, sunning themselves. At night they retreat to the water, where they live solitary lives and establish individual territories. Crocodiles and alligators are most at home in the water but are able to travel on land by sliding on their bellies, stepping along with their legs extended, or galloping awkwardly. Large adults can stay underwater for over an hour without breathing. They swim primarily by snakelike movements of their bodies and by powerful strokes of their muscular, oarlike tails, which are also effective weapons. A crocodile can also open its mouth when in the water due to a special valve in its throat. It allows the jaws to open without allowing water to move down the throat. When crocodiles float in the water, they leave only their nostrils, eyes, and ears above the surface. Their eyes can be covered with semitransparent membranes, much like a third eyelid and the ears and nostrils can be closed over by folds of skin. Young crocodiles eat worms and insects. As they mature, they add frogs, tadpoles, and fishes to their diets. 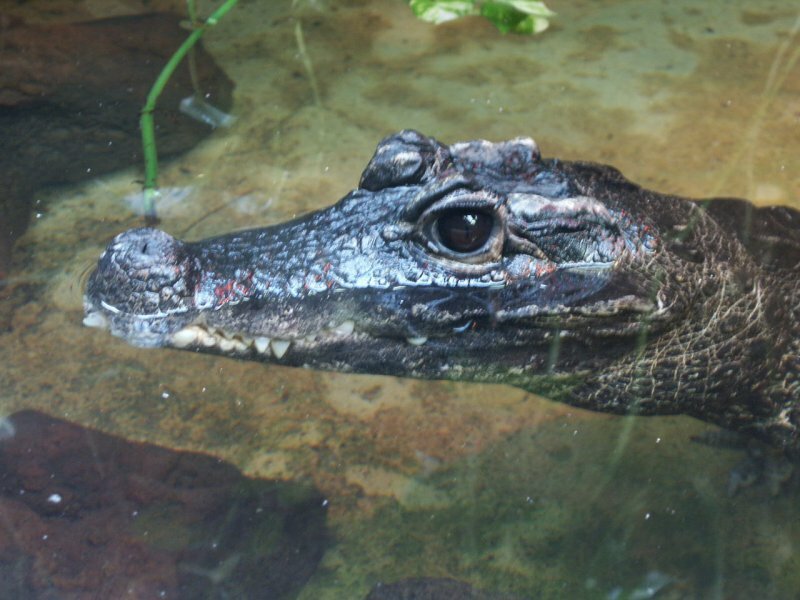 Older crocodilians nocturnal and solitary and they feed on other vertebrate animals as well as fish. The dwarf crocodile kills its prey and devours it immediately. Usually with crocodilians animals that are too large to be swallowed whole are either torn to pieces or are drowned and permitted to decay in burrows. The dwarf crocodile forms a land home by burrowing with its paws. The dwelling has only two passageways; one for entering and one for exiting. These burrows, which are dug at or just above the waterline, can extend for many feet and eventually end in a den, or chamber. The alligators hibernate in these burrows during cold weather. The dwarf crocodile female usually lays a clutch of less than 20 eggs. The eggs are placed in a mound of vegetation the female will assemble. The female will guard the nest and raise the young. Comments about the dwarf crocodiles of the Fort Worth Zoo. They are usually at rest when on display. I was told they are voracious when they eat and are exciting to watch when they move. They also seem peaceful when resting, however the attendant said there are much "safer" reptiles in the zoo. Though normally timid, the dwarf crocodiles are extremely aggressive to balance out their small size. Personal Observations: These dwarf crocodiles at the Fort Worth Zoo are typically at rest. They may be found lying on rocks or floating in the water. They also seem to enjoy watching the people watching them. This is most notable when you look into their eyes. It's easy to determine how they are different from alligators by observing them. It’s apparent that they are crocodiles by the fourth tooth being easily visible. Most of their coloring is dark brown indicating that they are a majority of mature adults. Their small size for their coloring tells you that they are dwarfs. Looking above at the picture of the dwarf crocodile it’s easy to see these physical traits. Current research: Current research is dealing primarily with reproduction and repopulation of the Dwarf crocodile. It is necessary to continue this type of research to get the crocodile off the endangered species list and back into their natural habitat, where they belong. These types of research are both government and privately organized, and are often covered under International treaties. Pope, Clifford. The Reptile World. New York. Knopf Books, 1955. Wild,Wild World of Animals: Reptiles & Amphibians. Time Life Television Series. 1976. Strawn, Martha A. Alligators: Prehistoric Presence in the American Landscape. Baltimore. John Hopkins University Press, 1997. Guggisberg, C.A.W. Crocodiles. Harrisburg. Stackpole Books, 1972.